Remember Larry’s sourdough bread method? In case you missed it, Larry, the Keep It Simple Engineer, has got sourdough bread making down to a science. He shared a four–part series showing how he does it. Larry mentioned in the introduction that he does a jalapeño-cheese variation, which I’m still waiting to see. (Hint-hint, Larry. 🙂 ) While we’re waiting for that one, here are an onion version, and one with pepper. Humans are a restless lot, always seeking to “improve”. This hasn’t always worked out well. In this case however, I’m just adding variations on a successful technique! What I have done is find a few ways to improve on my sourdough method. Simple yet tasty. It should work on any bread, not just my sourdough. 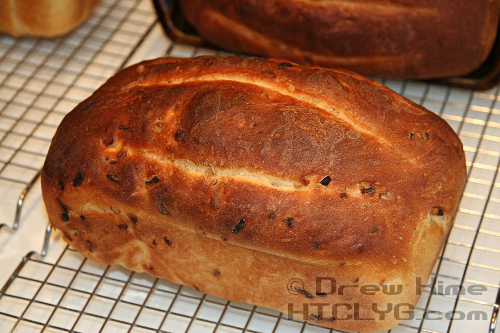 The onion bread has proved very popular, one good friend reporting that a loaf of “regular” sourdough will last five days, but the onion sourdough only lasts three days. It makes an absolutely terrific grilled cheese sandwich. Start with dehydrated onions. (Follow that link to see how to make your own.) I use half roasted and half plain dehydrated. Put about 1/3 cup of each in a suitable dish, fill with dry vermouth (dry sherry works, but not cooking sherry which has salt) and let it sit overnight. The next day just add them to the bread after autolysing and before kneading. My uncle, my father’s brother, would go out into the garden which was in the iron and sulfur rich soil of east Texas, pull up an onion, wash it off under the cistern pump, then eat it like an apple. East Texas onions are so pungent that if the word “pungent” had yet to be invented, it would have been just for them. My uncle’s onion eating perplexed my father, who couldn’t see how anyone could eat an onion like that without salt. [NOTE from Drew: Onions — along with garlic, leeks, and chives — absorb sulfur very efficiently from the soil. That’s what gives them their hot flavor. When the vapors released by cutting the onion get in your eyes, they mix with tears to form sulfuric acid. That’s what makes you cry. This is a pepper lovers delight. It’s wonderful sliced, lightly buttered, then grilled on the barbecue, and it makes the best smoked turkey with mayonnaise sandwich. Or make croûtons for green salads with blue cheese dressing. 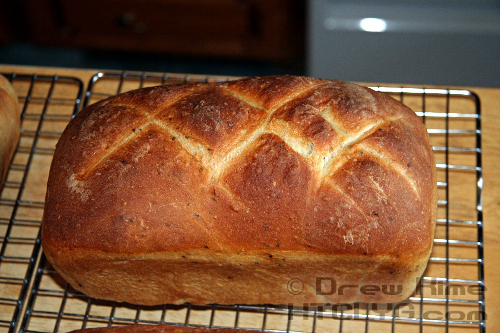 Just add one tablespoon of coarsely ground black pepper after autolysing and before kneading. I’ve added as much as two tablespoons, but you really gotta love pepper. Black pepper is a ground-up dried fruit originally from southern India. Today, most pepper comes from Vietnam, over 100,000 tons, and that’s nothing to sneeze at. Next to salt — where it is often found — it is the most common table top seasoning and also the most traded seasoning in the world. Pepper increases the body’s absorption of some nutrients. Gesundheit!